At Nitro, we help people achieve their financial goals after college, but those aren't the only accomplishments that matter. To learn more, we surveyed over 1,100 people across the country about the ways they compare themselves to their friends to find out what makes them feel worse or better about their own life. Curious what your personality type, age, or industry might have to do with your disposition after comparing yourself to your friends? Read on to see what we discovered. While research generally points to the harmful effects of spending too much time worrying about what’s happening in someone else’s life, millennials we polled felt a different sense of accomplishment about themselves in several situations compared to older generations. More than 1 in 5 millennials confessed to feeling less accomplished in regard to their own sense of independence when compared to their friends. In 2017, nearly 1 in 3 millennials (whose biggest financial burden often includes student loans) were still living at home and relying on their parents for support. Millennials also typically felt far worse about their parental status than older generations. Like the number of young people choosing to stay shacked up with their parents for longer periods of time, people in this age group are often having fewer children than generations that came before them. 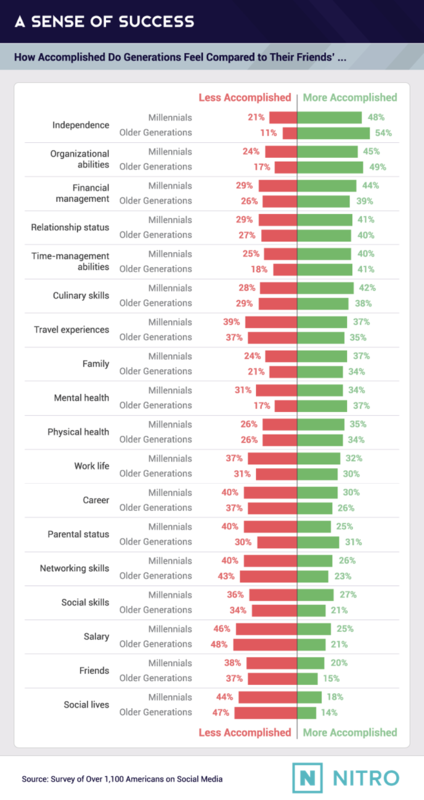 We found both older and younger generations felt much less accomplished in several categories when compared to those of their friends: social lives, salaries, and networking skills. In 2013, the term “FOMO” was added to the Oxford English Dictionary, and if Americans we polled are any indication, the “fear of missing out” on what’s going on in friends’ lives is literally making us feel less adequate. Another 39% of millennials also felt less accomplished about their travel experiences, a passion they typically value higher than older generations. When it comes to how we see ourselves through the lens of someone else’s life, one tool does the job better than anything else: social media. According to one study, the average person spends more than five years of their life on social media platforms including Facebook, Instagram, and Twitter. That may be good news for businesses using social media as an advertising tool (to the tune of $36 billion across the world in 2017) but not so great for our mental health or self-confidence. Research has shown it takes women a mere 10 minutes on Facebook before their mood worsens and they start to feel dissatisfied with their physical appearance. 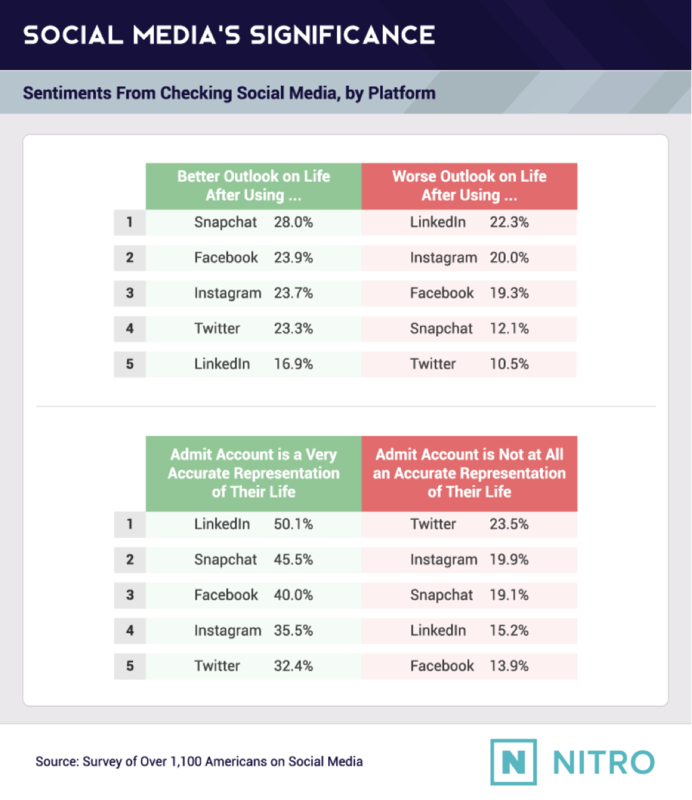 Social media might not be all bad though, and Americans we polled admitted to having a better outlook on life when they spent more time on certain social platforms. Snapchat, which continues to thrive despite having many of its core functions copied by Instagram and Facebook, made people feel the best. A solid 28% of Snapchat users said they had a better outlook on life when they checked for new snaps or stories in the program, followed by less than 24% of Facebook and Instagram users. While the number of people starting new Snapchat accounts isn’t growing as quickly as some other social platforms, users spend nearly 33 minutes engaged in Snapchat every day. Still, we found those same platforms made some people feel worse. More than 22% of LinkedIn users said they had a worse outlook on life after checking out updates, followed by roughly 1 in 4 Instagram and Facebook users. These negative emotions might have something to do with the occasionally disingenuous content Americans are sharing to make their lives seem more interesting to their friends and followers. While roughly half of LinkedIn users we polled said their accounts were a very accurate representation of real life, nearly 1 in 4 Twitter users and 1 in 5 Instagram users admitted their accounts weren’t at all accurate depictions of their actual lives. Women we polled were more negatively affected by comparing themselves to their friends than men. Both men and women had a similar perspective on how accomplished they felt about their families comparatively, however women felt slightly more accomplished when asked about their relationship and parental status. While men responded more favorably to the positive impact of our modern “keeping up with the Joneses” questionnaire, they typically felt the least accomplished when measuring their parental status, social lives, and salaries against their friends. 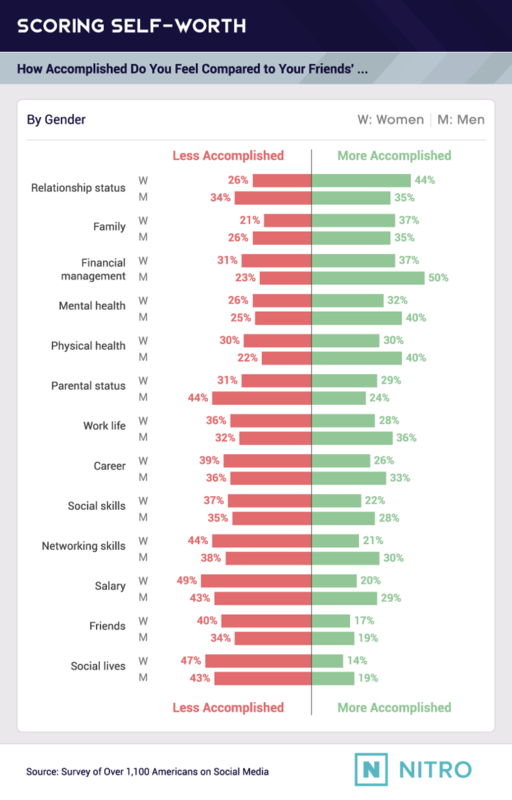 For women, we found the biggest gaps between the diminished sense of accomplishment they experienced compared to men in three key areas: financial management, physical health, and their work salaries. While economic reports show women earn 74 cents on the dollar compared to men and further research suggests women are generally less comfortable discussing their salaries, some experts suggest you should always attempt to negotiate before accepting a new position or job. Americans of various ages were also more affected by certain elements of their friends’ lives (or what they see of them on social media) and the various social platforms we asked them about. Baby boomers generally weren’t as put off by the content they saw on social media, though they were negatively affected by the perception of their friends’ accomplishments in real life. Salary, social life, and friends were the most souring elements while independence, organizational abilities, and mental health left them feeling the most accomplished. As more boomers head into retirement potentially unprepared to enjoy their golden years financially, a working retirement has become the reality for nearly 1 in 5 Americans over the age of 65. Feeling accomplished by a sense of independence was a common theme across all four generations, followed by pride in organizational abilities. And while Gen Xers and millennials shared feelings of being less accomplished in contrast to their friends’ social lives and work salaries, younger Americans (Generation Z) reported feeling worse in relation to their friends’ relationship statuses. Generation Z might have the best sense of accomplishment when compared to their friends’ lives but, like millennials, the youngest Americans we polled were the most negatively affected by the impact of social media. Instagram and Facebook made Generation Z respondents feel the worst about themselves, while 1 in 4 millennials said LinkedIn gave them a worse outlook on life. In 2016, the national unemployment rate was just 4.9% compared to 12.8% for millennials. Research shows Americans of all ages recognize it can be hard for younger professionals to get started in the modern workforce where credit scores, lack of experience, and overconfidence often hold them back. Some analysts have identified a connection between people with confidence and the (positive) impact it can have on their wallets. The surer of yourself you are, the more likely you might be to ask for what you want financially or to make a good impression on your boss. You may even feel less concerned with what’s going on in other people’s lives. 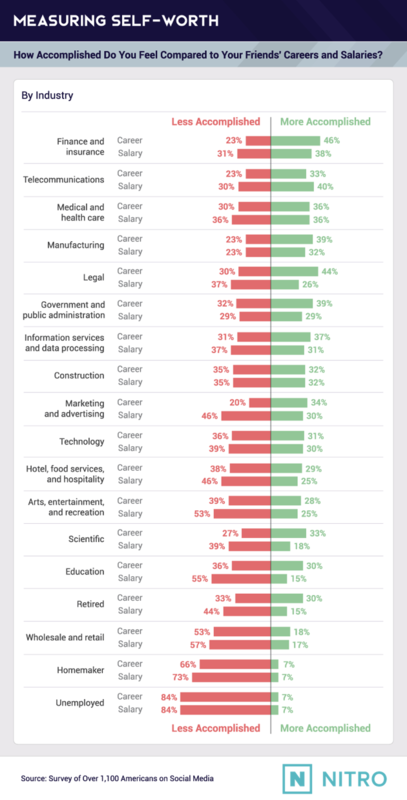 Americans we polled who admitted to feeling the most accomplished about their careers typically felt less accomplished about their actual salaries. Across the country, more than 7.6 million people work multiple jobs to make ends meet – a number that continues to rise. People we polled working in the finance and insurance industry, telecommunications, and marketing or advertising felt the most accomplished about their careers and income compared to other Americans. In contrast, we learned unemployed Americans, homemakers, and retail or wholesale employees felt the worst about both elements of their professional lives. Even retired Americans weren’t immune to the pressures of measuring themselves against the people around them. More than 2 in 5 people who’d retired from the workforce still felt less accomplished about their income compared to that of their friends. Information: Do you prefer to focus on the basic information you take in, or do you prefer to interpret and add meaning? This is called Sensing (S) or Intuition (N). Structure: In dealing with the outside world, do you prefer to get things decided, or do you prefer to stay open to new information and options? This is called Judging (J) or Perceiving (P). People we polled who identified themselves as introverts rather than extroverts were more likely to feel strongly about organizational skills, while independence was a leading trait for extroverts. Extroverts often identified feeling more accomplished by their social lives in comparison to their friends, while nearly all of the introverts we surveyed (with the exception of ISTP) admitted feeling negatively affected by the accomplishments of their friends’ social activities. Still, despite the perception that extroverts might be naturally more outgoing than introverts, some were just as likely as introverts to feel poorly about themselves for social reasons. Both ESFJ and ENTJ respondents acknowledged feeling less accomplished by their number of friends, and even a few extroverts (ENFP, ENTP, and ESTJ) identified their social lives as being negatively affected by their perception of the people around them. Personality indicators could also have something to do with how a person is affected by social media. More than 1 in 4 INFJ, INFP, and INTP Americans said they had a worse outlook on life after using Facebook, and 40% of ESTJ Americans had a similar perception after using Instagram. You may already have an idea of what the new year will mean for you based on your zodiac sign, but what about how your sign could be affecting how you feel about yourself in comparison to your friends and their social media presence? Independence was the standout trait among most signs, with the exception of Aries, Sagittarius, and Capricorn, all of who felt the most accomplished by their organizational abilities. Aries was the only sign to list feeling positivity about their relationship status compared to the love lives of their friends, while Scorpios identified feeling more accomplished in terms of family relations than anyone else. Gemini, Virgo, and Capricorn were the only signs not to list the amount of money their friends earned as having a negative impact on their own sense of accomplishment. While they might feel more strongly about their financial or professional standing, all three also said the social lives of their friends made them feel less accomplished about themselves. Your sign could also be an indication of how you might react to social media. Pisces and Leo signs were the most likely to have a worse outlook on life after using Facebook, and Aries, Taurus, and Leo signs had similar feelings after using Instagram. Good, bad, or otherwise, Americans we polled acknowledged the different ways they compared themselves to the people around them. While social media didn’t exclusively make people feel worse about the way they see the world, certain personality types and even zodiac signs were more attuned to the sometimes negative energy created by social sites like Facebook and Instagram. While trying to measure themselves against their friends’ lives sometimes left those we surveyed feeling more accomplished, social life and salary were often identified as being worse for wear in these efforts of comparison. At Nitro, we know what kind of impact monthly student loan payments can have on your financial stability. If you’re looking for a fast and easy solution for paying down your loans, we’ll help you compare your refinance options with lenders across the country. From private and federal loans for graduate and undergraduate degrees, you’ll be able to pick the rate and monthly payments that work for you. Want to learn more about how refinancing can change your life? Visit us online today at NitroCollege.com. We collected 1,146 responses from Amazon’s Mechanical Turk. 55% of participants were female, 44% were male, and 1% did not identify with either gender. Participants ranged in age from 18 to 74, with a mean of 35 and standard deviation of 11.81. Only participants who lived in the U.S. and have a Facebook, Instagram, Snapchat, Twitter, and/or LinkedIn account were qualified to take the survey and were included in the analysis. The sample size of Americans on social media was 1,146 people. It is possible that with more participants, we could have gained more insight into this population. As noted on the asset, the sample size for three Myers-Briggs Type Indicators® was below average. All personality types except ESTP, ESFP, and ESTJ had at least 28 respondents, with a mean of 53 respondents. ESTP and ESFP had 19 respondents, while ESTJ had 22. Like our story? You don’t have to feel envious of our research or the graphics used here. Feel free to share any of our content with your readers for noncommercial use; just ensure a link back to this page so everyone gets credit for their work.